Jalali Date System is one of most systematic calendar systems. 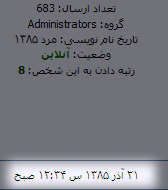 This plugin change your view of the board for showing all dates in Jalali format. This plugin is fully compatible with PHP date() function's symbols.